Lawyers claimed victory yesterday as ministers revealed that plans to introduce fixed costs in clinical negligence claims will implemented in cases valued up to £25,000 rather than £250,000. Specialists had feared that the government would set the higher fee, which they argued would severely limit the legal advice available to those claiming serious negligence by doctors. But their joy was tempered by proposals for a rise in the fixed costs regime to that level for general personal injury cases. Lord O’Shaughnessy, a minister at the Department of Health, announced the revised proposals yesterday in a consultation paper. Ministers maintain that 36 per cent of the cost of clinical negligence claims against the NHS relates directly to the cost of litigation in claimant and defence costs. O’Shaughnessy said that for claims of less than £25,000, claimant recoverable legal costs are on average 220 per cent of damages awarded. “Where litigation is needed,” he said, “the process will be streamlined so that the injured person and their family reach a resolution more quickly, confident that change will occur, and that harm will not happen to others. The minister added that “it is right that the government should endeavour to reduce the cost of litigation so that more resources are available for NHS patient care”. Sugarman said the NHS needed to change its approach to litigation. “Above all, we need an end to the deny, defend and delay approach by medical professionals when something has gone wrong, which is all too common,” he added. Robert Bourns, president of the Law Society, which represents solicitors in England and Wales, also cautiously welcomed the government’s move. Despite quietly celebrating the Department of Health’s u-turn, lawyers were still battling over wider proposals to set the fixed fee limit at £250,000 for personal injury claims. Responding to a consultation from Sir Rupert Jackson, the Court of Appeal judge reviewing the system, solicitors and costs lawyers called for the proposals to be at least put on hold, if not ditched. The Association of Costs Lawyers pointed out that the current regime was only three years old and had not been fully assessed. “Our members accept that extensions to the fixed recoverable costs regime may follow over time,” it said in a statement. The Law Society also weighed in. Bourns warned that if costs were fixed at the level proposed by the government, “for at least some cases and possibly most, the costs that a successful party could recover will fall significantly short of the costs they have incurred”. In our view fixed costs are likely to result in more ADR or earlier settlements as Claimants realise that it is uneconomical to run cases to trial. 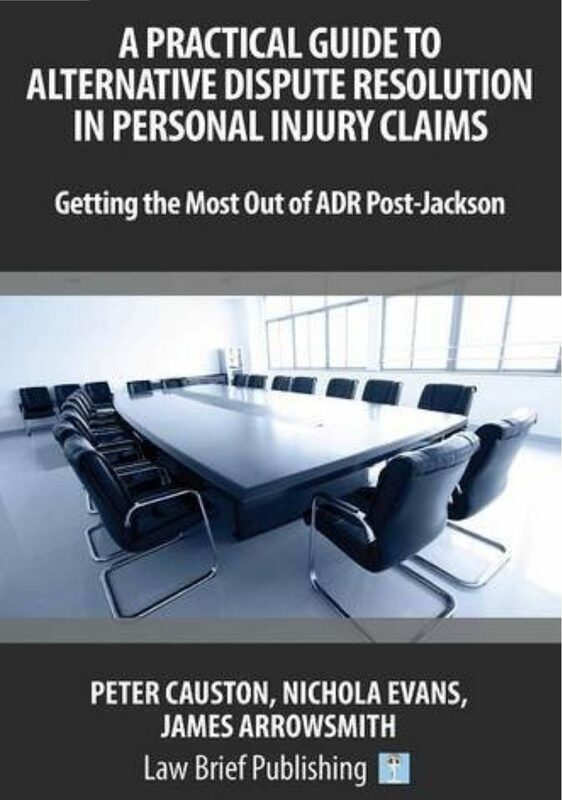 We have recently written a book about ADR and personal injury claims available from Law Brief Publishing.